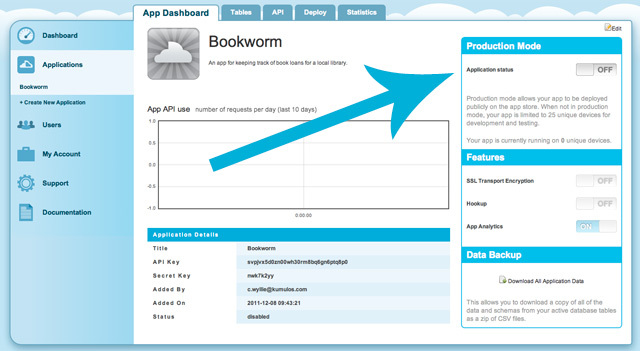 So you've got an awesome app built with Kumulos and you're nearing your publishing date. Here's what you should do to ensure your launch goes smoothly. On your app's dashboard, there's a switch called "Application status" which will be "Off". To go live, simply flick this switch to "On" and press "Ok" on the dialog. You'll be taken to the billing entry page to enter your card details. After filling in your details and clicking "Subscribe", you will be taken to your account overview on the "My Account" page. This breaks down your monthly subscription in a readable manner. If you'd like more specific information, you can view all billing information about your account on the "Billing History" tab of the "My Account" page. That's it! 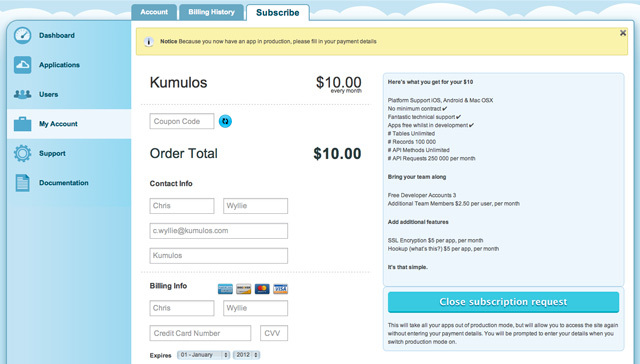 After successfully subscribing, Kumulos will serve API requests to more than 25 devices for your live apps.